- This property comes with complimentary beach service March 1st - October 31st and includes 1 set: 2 chairs and 1 umbrella through Holiday Isle Beach Chair Service. - Steps from the Beach! - This property comes with 4 dedicated parking spots. DETAILS: “Liahona” is a light-filled and tranquil Miramar Beach home that’s perfect for your next 30A getaway! With 5 bedrooms, 5.5 bathrooms, and accommodations for 22 guests, this home has everything you need for a relaxing vacation. 13 Port Court features a private pool, two bunk rooms, and is just steps from the sugar white sand beach and coastal emerald waters. Guests are welcomed into this bright and tranquil home on the first level, which features a mudroom entryway, a spacious living area with lots of seating, a mounted flat-screen television, and a wet bar. The first floor also offers a queen bed guestroom with a large, mounted flat-screen television and a private bathroom with a dual-sink vanity and a shower/tub combo. A spacious, open-concept floorplan gives the second floor a wonderful flow between the living, dining, and kitchen areas. The gourmet kitchen features bright white cabinetry, marble countertops, and premium stainless steel appliances. The adjacent dining area offers ample seating, with additional seating at the nearby breakfast bar. Plush, comfortable seating—including an oversized sectional sofa and two lovely armchairs—and a large, mounted flat-screen television await in the living room. Pale blue walls and tasteful oceanic décor make this area a peaceful place to relax. Also on this level is a large master suite, which features a king bed, private porch with gulf views, and a private en suite bathroom with a generously sized shower. Three guest rooms on the third floor offer a variety of sleeping arrangements. The first bunk room features two full-over-full bunk beds and a shared bathroom with a glass-front shower. The second bunk room has two full-over-full bunk beds and a private bathroom with a shower. In the spacious third-floor master suite, guests will enjoy a beautiful king bed and a private en suite bathroom with a dual-sink vanity, a shower, and a separate soaking tub. 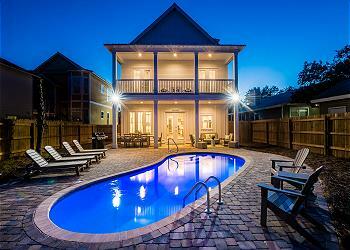 Guests will enjoy the home’s private, sparkling pool and the second-floor porch with stunning emerald coast views. The sugar white sand beach is just steps away and beckons you for a day of fun and sun. Enjoy a breezy ride through our 30A towns on one of the home’s five custom 360 Blue adult beachcruiser bikes. With world-class dining and shopping, endless entertainment options, and the most breathtaking scenery along the gulf coast, 30A is the perfect place for your next getaway. 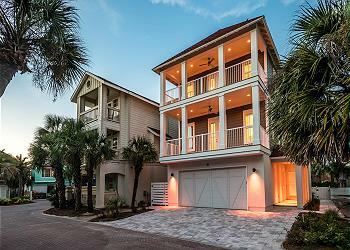 Contact 360 Blue today to book your stay at 13 Port Court in Miramar Beach! We had a excellent experience staying in this house and having a private beach within a short walking distance. The house was clean and had everything we needed. We had to call 1 time due to a shower door not closing, and within the hour someone was there fixing it. We would definitely stay in this property again. We stayed here in March 2019 and couldn’t have had a better experience. The distance from the beach is a few steps and the small pool at the house was perfect for the kids. The house has everything you need in the kitchen along with the grille on the patio that we used multiple times. Great location was close to everything we needed. Will definitely book here again!